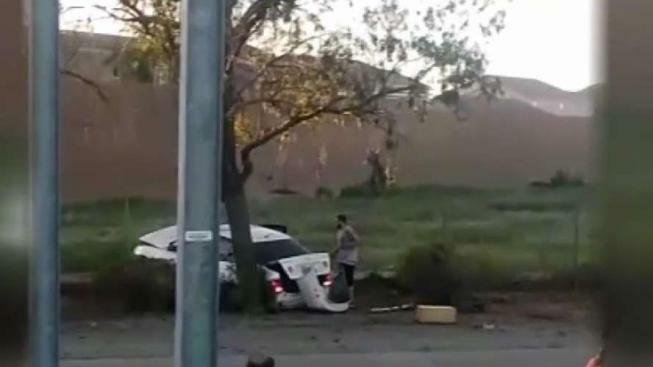 Authorities say a 25-year-old Arizona man who was driving a San Diego-area woman's car is accused of fatally stabbing her after the vehicle veered off a freeway and crashed in a Phoenix suburb. The crash and subsequent stabbing happened during the morning rush hour, just before 7 a.m. Friday, Arizona State Trooper Kameron Lee said. The car went off the freeway, went through the dry canal and ended by the boundary fence, he said. Fernando Acosta of Phoenix got out of the car and accosted a witness with a knife before repeatedly stabbing Martha Thy of Spring Valley, California, on Friday along the Loop 101 freeway in Peoria, according to an Arizona Department of Public Safety probable-cause statement released Saturday. NBC 7 has confirmed Acosta was the victim's boyfriend and the two have been in a yearslong relationship. After the crash, nearly a dozen bystanders pulled over to help, including Gustavo Munoz. "When I got to the other side of the ditch the guy comes out with a knife saying, 'What the f--- do you want? What the f--- do you want?' And the lady was in the passenger side filled with blood already," he said. The probable-cause statement said Thy was stabbed while she was inside the car and on the ground outside it. "(He was) stabbing her and stabbing her," Munoz said. That was until another bystander shot Acosta, firing the gun six times. Acosta fell to the ground and Munoz and others moved in to detain the suspect. "(I) put my knee on his back so he couldn't move," Munoz said. "He was moving like crazy and laughing while he was doing it. That's when we took a couple hits to his face. We got him so he can stop, but he was like 'Do it again, do it again,' and he was just laughing." State troopers and police arrived minutes later to a chaotic scene. "There people everywhere, some screaming, yelling going on," Lee said. "You can imagine what an officer's feeling when he arrived on the scene and all he sees are people running around and possible fight and things like that." Thy was taken to an area hospital where she died. Acosta was treated for non-life-threatening injuries and remained jailed Saturday on suspicion of premeditated first-degree murder and aggravated assault. Court records don't list an attorney who could comment on Acosta's behalf regarding the allegations.